A lot of people are working very hard at becoming rich. Some will make it, but most won’t – at least statistically speaking. But you don’t have to be rich in order to be happy and successful in life. You can become cash-rich, and have all the same benefits. What Is Cash-Rich, And How Is It Different From Regular Rich? Cash-rich means having enough money to live your life, plus some extra for savings, investment and fun. It is determined purely by individual factors. For one person, that can mean making $25,000 per year. For another, it could mean making $250,000 per year. And since most of us can live on far less money than we think, the real number is probably a lot lower than we realize. Regular rich is more objective. It’s usually measured in certain dollar figures, particularly as they relate to income and net worth. Perhaps the fact that it’s measurable is the reason so many people pursue it. Since it often has a specific number attached to it, it can be displayed almost like a trophy. That appeals to our humanity. While regular rich can mean a lot of tangible evidence of your financial success, it often also comes with complications and more than a small amount of stress. It is not unusual for the regular rich to have less freedom and mobility than the merely cash-rich. There is high income and investment worth, but there is also a high living standard soaking up a lot of the extra money. Being cash-rich can be just as satisfying. You may not have the tangible evidence of your financial success, but you’re largely free to come and go as you please. You live in a lifestyle that you can easily afford, you have extra money, and you can often do the things that you want to do in your life. In addition, you may find it much easier for you to change jobs or even residences, since these elements don’t define your life. In the end, quality of life is the real objective we all seek. Regular rich often resembles a money chase. You reach a certain level of wealth or income, then immediately set new goals for each. You’re constantly striving for higher numbers. But if cash-rich is the goal, your primary objective is to avoid overextending yourself. For most of us, that’s a much more simple process. Despite your best efforts, you may never become rich. Worse, you may become rich and then lose it all. You may become rich, but also lose your health, your family, or your friends in the process. Many people become so driven by the desire to get rich, that these can become common casualties of the effort. You may not live long enough to enjoy your wealth. “For what shall it profit a man, if he shall gain the whole world, and lose his own soul?” – Mark 8:36. I can’t say it any better. Chasing regular rich is not a risk-free proposition. Since it is much closer to the ground, becoming cash-rich is usually easier to attain. In fact, a number of Bible verses – especially in Proverbs – that tell us to do just that. Even more important, by being cash-rich you can enjoy many of the same quality of life benefits normally reserved for the regular rich. It won’t be anywhere near as opulent, but then we won’t be taking anything out of this world when we leave it anyway. 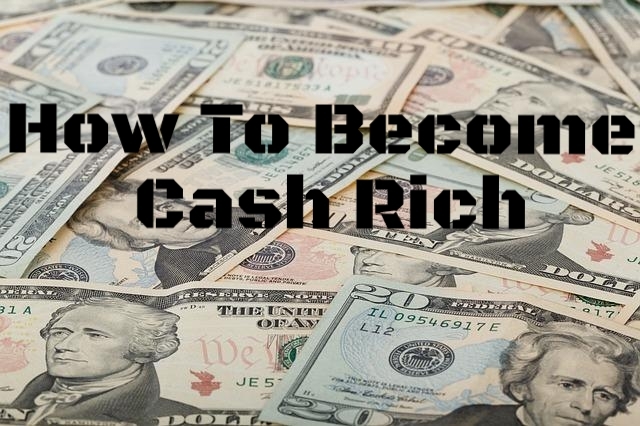 Becoming cash-rich is usually much easier to achieve than becoming a regular rich. In fact, it’s well within reach of the average person of ordinary means. Start by living beneath your means. Becoming cash-rich all starts with this concept. What ever it is that you make, you live on at least a little bit less. This not only forces you to keep your living expenses low, but it leaves extra money for the next two steps. Become a saver. The money that you save from living beneath your means can go immediately into savings. Once you have several months worth of living expenses sitting safely in a bank account, your entire financial outlook will change. The financial stress will disappear, you’ll sleep better at night, you’ll think with more clarity, and you may even be able start investing your money to make more money. That’s the basic thing that regular rich people do, but you have to be cash-rich before you even begin to think about it. Gradually pay off your debt. Once you have some money saved – and the financial strength that it brings – you can begin to gradually payoff your debt. As your debt payments begin to drop, you’ll have more control over your income, to save more and to do more. There’s no need to invest 20 or 30 years in building a business or career, no requirement to build a seven-figure investment portfolio, and no necessity for a mansion or luxury car. You’ll have control over your income and your money, and that’s all you need to be cash-rich. 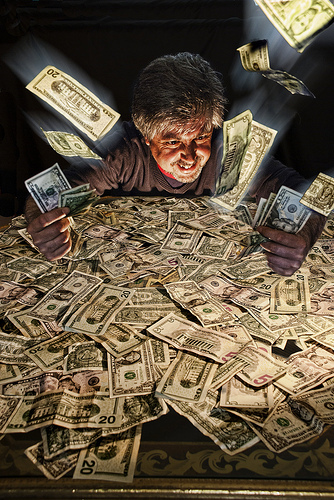 Are you ready to abandon the chase to become regular rich, and focus instead on becoming cash-rich?